The way to experience true human kindness is as simple as this. Extend the love and warmth that you would give your nearest and dearest to any person that crosses your path. The warmth that person receives is then shared on and on, and the environment in which this takes place seems to glow with energy from all the experience. In Spanish, that energy and feeling is called Buena Onda, meaning good vibes. 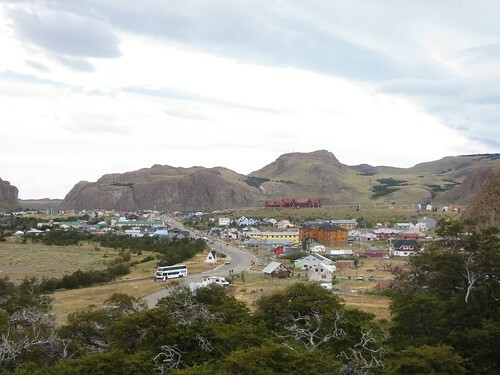 And that’s exactly what you will find in the town of El Chalten, Argentina, in the home of a woman called Flor. 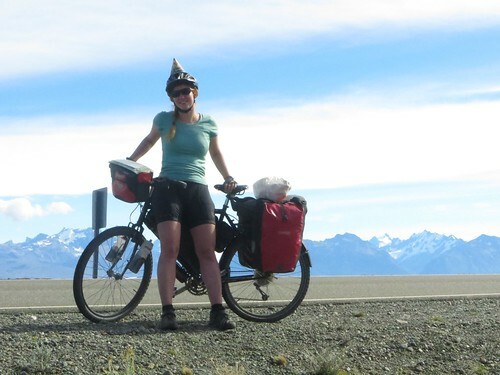 All year round, her small yard is open for cyclists to camp; she would never turn a person away, which in high season can mean more than 30 tired, stinky and hungry cyclists depending on her hospitality. These cyclists use her one bathroom; they share her family’s space, on the unspoken promise that her home and fellow guests are respected. Her aim is to spread love in the world, and opening her heart to strangers is Flor’s own unique way of doing it; Flor is the kind of person that makes the phrase ‘real life angel’ seem far from grandiose. 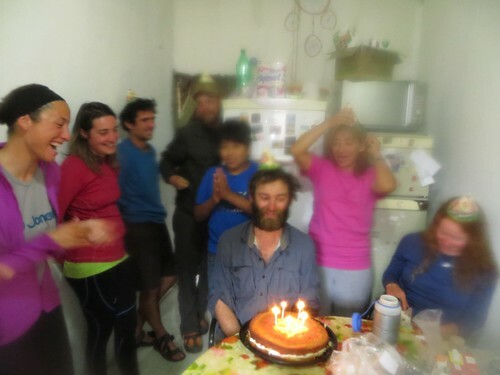 The Buena Onda in her home comes from a collective happiness, sharing meals, stories and personal experiences, that for us cyclists were times of pure joy. 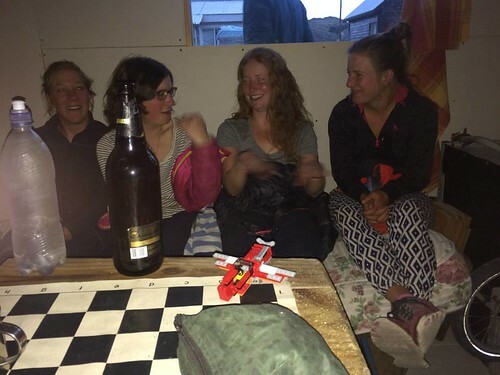 Being lucky enough to discover the depths of generosity in human nature, through people like Flor, has been the most important lesson of my bike tour, and these final weeks of the trip were bountiful with goodness and exuberance. 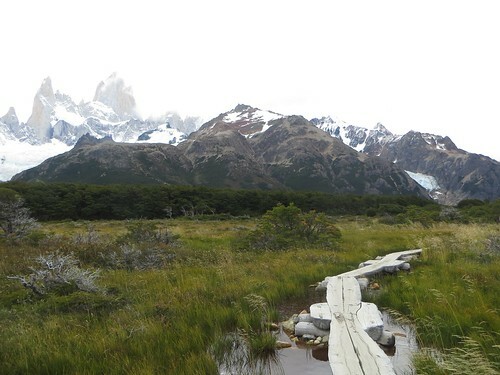 During our time in El Chalten we also went hiking up towards Monte Fitz Roy. I had also arranged to have a job interview via telephone; as I explained in a previous entry, this was a job in the place I had worked at prior to coming on this trip, and one that I very much wanted. 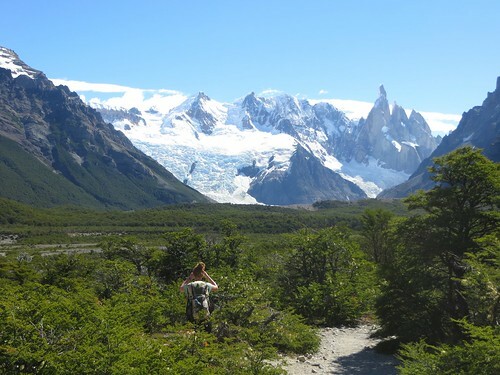 I got the job, which only added to the emotional richness of our time in El Chalten. Flor’s yard looking very empty (I actually took this on the last day once we had packed our tents down). Flor’s house is known as El Charito, which is also the name of the street. 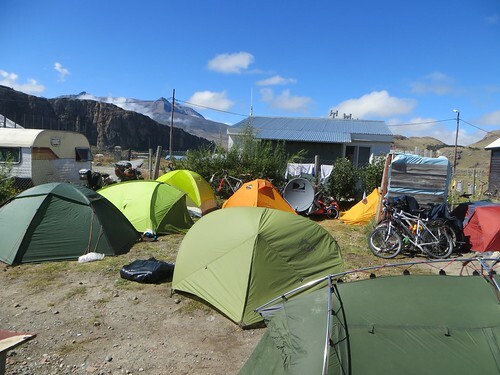 We were initially overwhelmed due to the amount of people around and having to put our tent up in an already very occupied yard. The wind was strong that afternoon, and blew my tent pole out of it’s place which made a hole in my tent. We then had to take my tent down and put Charmian’s up. 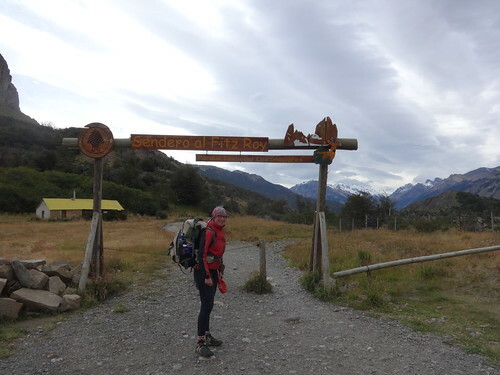 Attempts to fix my tent were futile but it didn’t matter too much because we actually mainly avoided camping once we left El Chalten. One of the rules in Flor’s house is that if you use her kitchen to cook, you cook for all. That night two Brazilian cyclists, Dieisson and Diego, cooked up some Brazilian food for around 30 cyclists. 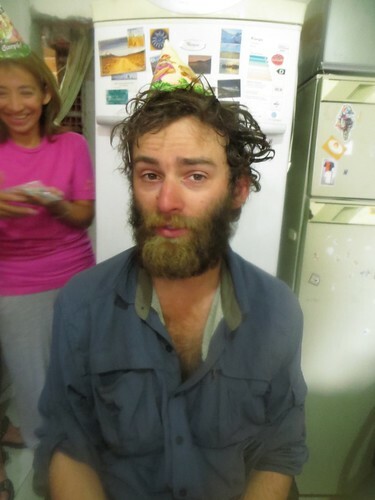 That day I met Matt (USA) who I had been aware of for over a year as he had ridden with Leah in Colombia, Matt and Lee were good friends having ridden Ecuador together. Notice Flor’s son Fernando, centre in the striped t-shirt. That night we were in high spirits so Matt, Lee, Charmian and I stayed up drinking wine ’til late. Seth is alergic to bee stings so when he got bitten within half an hour of arriving at El Charito it was a big deal. 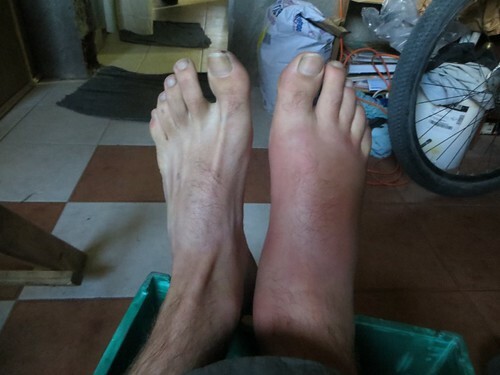 This is his foot the following day. 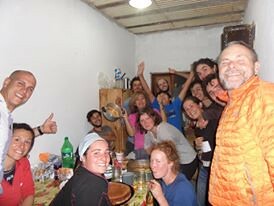 That day we did nothing but sit around chatting, oh, and some Italian cyclists made individual pizzas for all of the cyclists. 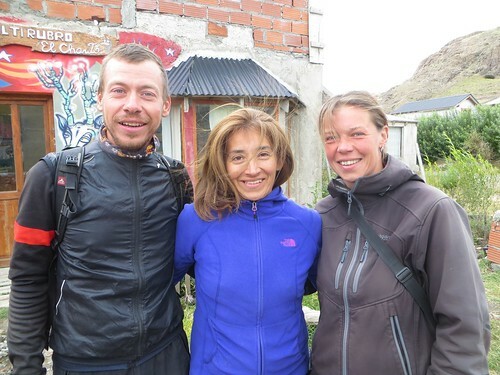 Flor with Bram and Katarina, a Belgian / German cycling couple that we had met back in the Casa del Ciclistas in Bolivia. It was great to see them as I did not know they were heading this way. I had spent the previous day in a coffee shop preparing for the job interview and that morning I had the interview in a telephone call place. Job interview out of the way, Charmian and I headed out of town onto some of the hiking trails around Fitz Roy, we stopped off at bakeries along the way to stock up on empanadas. 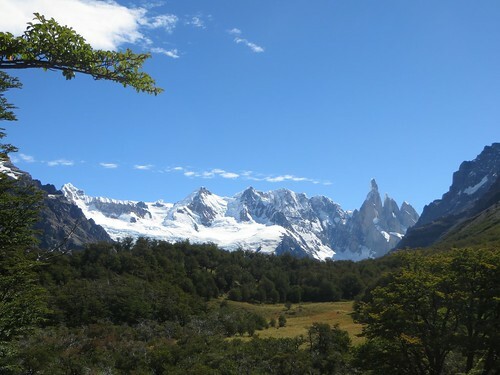 View of El Chalten from the beginning of the trail. 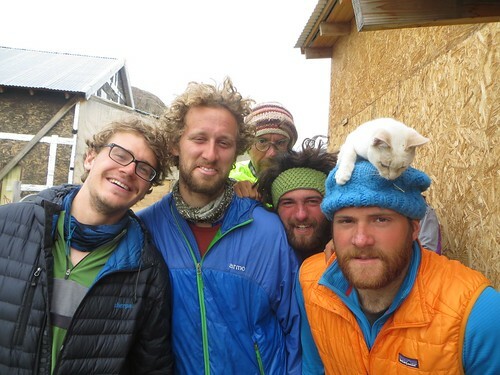 Matt, Lee, Seth and Paul had left the previous day for a 4 day hike through Paso de Huemul and Paso del Viento. 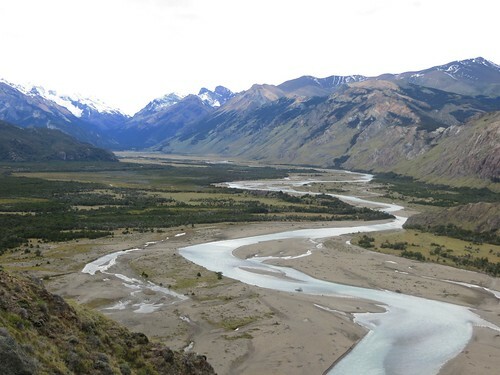 Views of the river we had cycled along on our way into El Chalten. 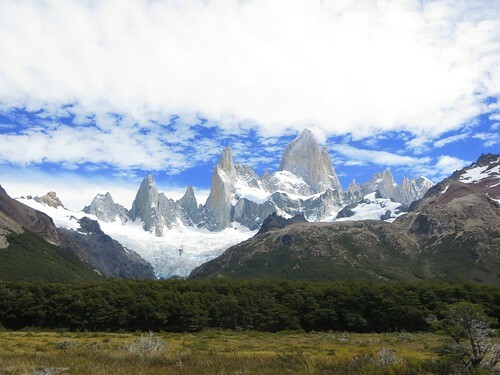 Fitz Roy! First of many pictures of this mountain. We stood around urging the cloud to pass but it did not. We camped at one of the large, free official campsites. 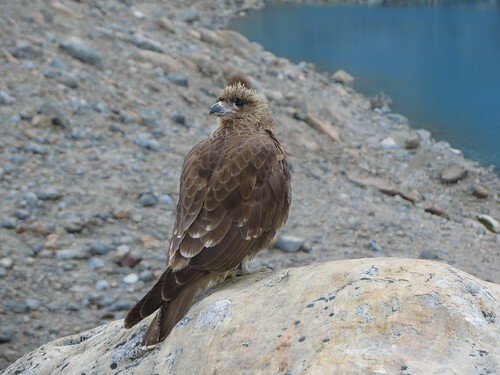 It was fine apart from plenty of obese mice and sparrows who had been living off hikers crumbs. 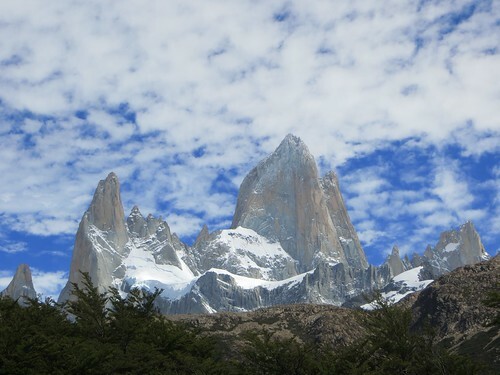 The following morning we hiked up to view Fitz Roy, again one cloud refused to budge. This little guy hung out with us for a while. 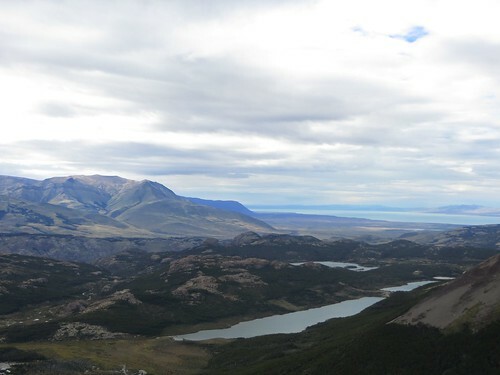 Views from the top of our climb, Lago Viedma can be seen in this distance. We hiked down from the path and the clouds finally cleared, giving us the money shot! 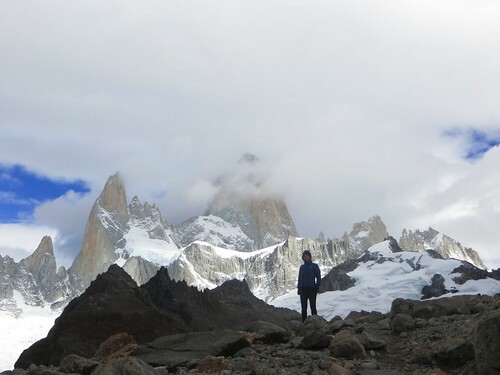 Wow, Fitzsimmons, er, I mean Fitz Roy! Off we went along the quiet forest path which connected the two main trails. 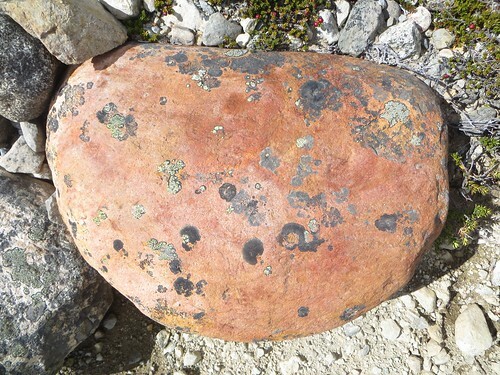 I loved this speckled rock. 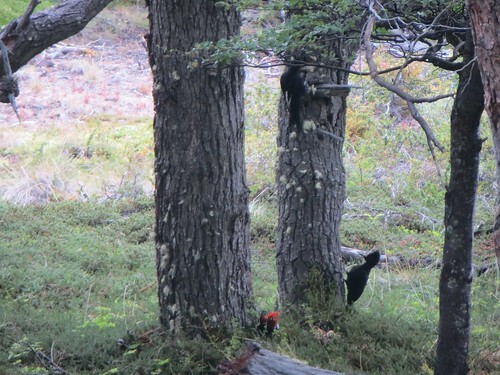 A bad picture of some impressive woodpeckers. 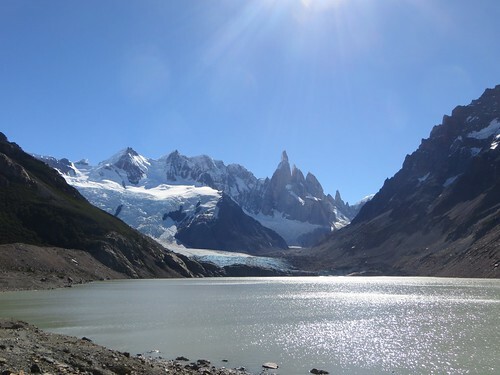 Cerro Torre to the right. 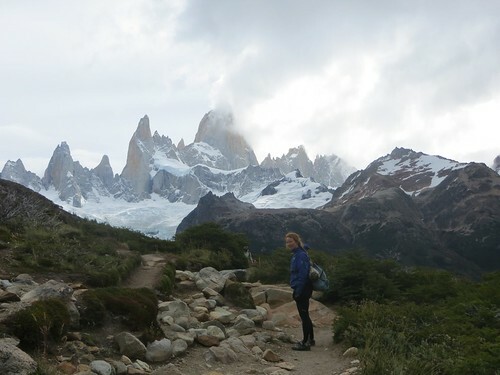 We were getting pretty tired by this point of the day but were urged on by the views of Torre. 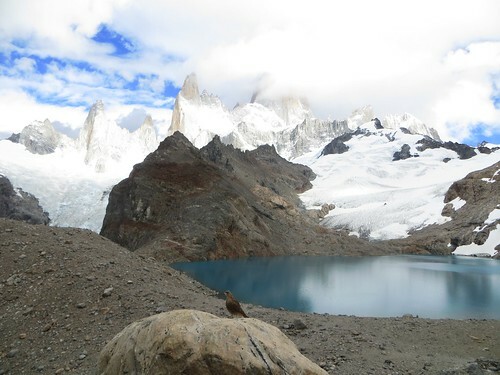 Laguna Torre with views of Cerro Torre, vale la pena (worth the effort). Jordy and Tim (USA) pictured with two Italian cyclists and an Argentinian. Tim would make us all laugh by speaking very good Spanish in a strong American accent, and Jordy was his more mild mannered sweet friend, buena onda. 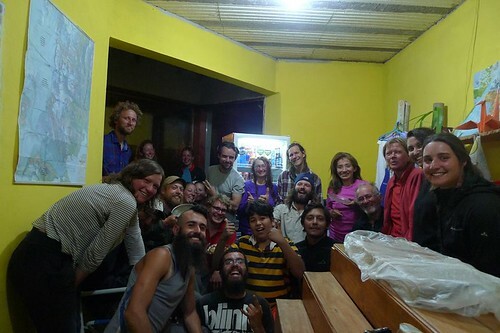 This was the day that they left, once they had gone Flor was upset and crying to see them go, we found it incredibly inspiring that she is able to open her hearts to everybody after having welcomed thousands of cyclists into her home. Some French boys make crepes for us that evening, yum! 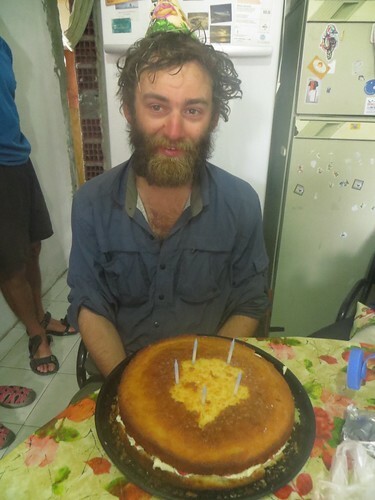 The previous day we had wanted to celebrate Seth’s birthday but due to the amount of crepes that had been prepared by the French we decided to eat cake for breakfast the following morning instead. Smile, Seth! Possibly a little overwhelmed by a breakfast birthday party? The kitchen was quite steamy. This was the giant Victoria Sponge cake that Charmian and I made and filled with jam and butter cream. It went down well, Buena Onda all round. 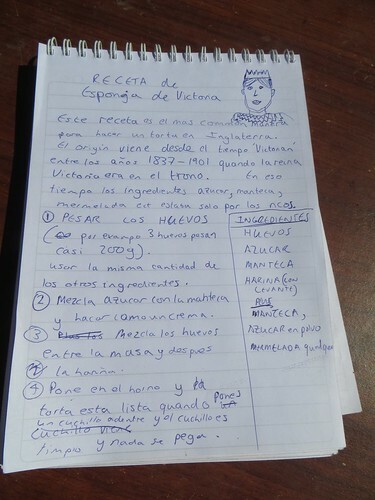 Some cyclists had made a recipe book for Flor which featured a photo of her with her famous empenadas on the cover. The idea is that each time a cyclist cooks something they leave the recipe in her book, a special way of sharing memories and recipes from around the world. Here I had written a few details about the cake – that it is the most common way of making a cake in Britain and the origins, plus a silly picture of Queen Victoria. 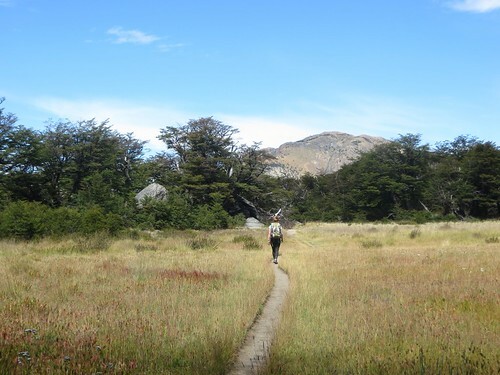 We left El Chalten ready for new adventures on the Patagonian Pampa, filled with love and memories we will carry with us forever. There’s a smile under all that homeless!